A major technical challenge with Solid Oxide Fuel Cells is the operating temperature which is typically in the 850 to 1100°C range (1562 to 2012°F). This high temperature also leads to large temperature gradients between different parts of the cell. Since a typical application requires a large number of cells wired in series and parallel, the temperature and gradient conditions demand fuel cell interconnect wiring and insulation with very special properties. To address the stringent requirements for these Solid Oxide Fuel Cell interconnects, Omega offers OMEGA™ XT or XC High Temperature nickel based conductor wire with Nextel ceramic or Silica Yarn Fiber Insulation. This combination delivers reliable performance when exposed to the wide temperature gradients and high operational temperatures. The wire easily survives constant exposure to the oxidizing and reducing conditions found in these cells. 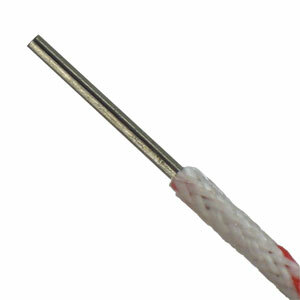 XTW-XT wire is a nickel based electrical conductor that can withstand temperature up to 1200 degrees Celsius. The XTW wrapped and braided insulation design is capable of passing a 3000 Volt High Pot test. The result is performance in extreme heat with superior test results for applications tested in that voltage range. Click open the Specs page for addtional details on Omega N wire configurations and Nextel ceramic insulation designs. Omegaclad XL Thermocouple temperature probes with proven long term stability and low drift are also available from stock. 100 ft, Duplex 2 wire Omega N® nickel based 24 awg round wire ,Nextel braided insulation on each wire,Nextel braid over the wire pair. 1000 ft, Duplex 2 wire Omega N® nickel based 24 awg round wire ,Nextel braided insulation on each wire,Nextel braid over the wire pair. 참고: Contact Omega Fuel Cell Components Engineering team at 1-800-826-6342 ext 3008 for samples , price and delivery information.